Summary: Louis the fox moves into a new house filled with big empty rooms to play in. On Louis’ first night, he finds a furry one-eyed monster cowering under his bed. The monster moans,"I'm cold and I'm scared, and I suppose that's why I'm under your bed." Louis kindly lets the monster crawl into bed with him and share his cozy blankets. The next day Louis takes the monster to the park where they both practice being brave, smiling, and talking to new kids. Making new friends isn't so hard after all! REM singing Furry Happy Monsters? Pure genius. This song will help your child enhance their emotional vocabulary. Children must learn to label their feelings so that they are better equipped to communicate them. 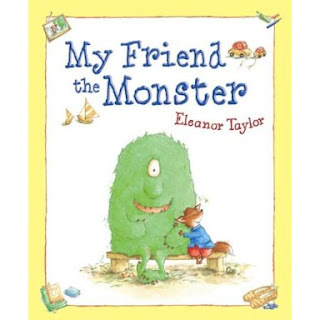 Furry Happy Monsters explores the words cheerful, glad, sighing, crying, and tearful. Plus it's fun to dance to!